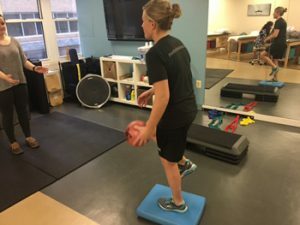 When considering the best exercises to prevent ACL injury, it’s always important to understand the mechanism of the injury so that you can strengthen the areas that are susceptible to break down leading up to an ACL injury. 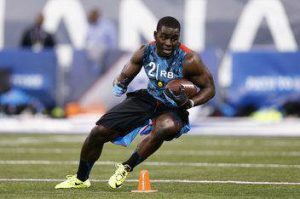 To simply put it… ACL injuries most often occur in non-contact situations and are commonly associated with; a lack of hip control and glute activation, which causes the knee to fall in on itself and stress the ACL; a combination of poor change of direction and landing technique; and a lack of quadricep strength. Glute activation is essential in the prevention of ACL injuries. The glutes are the main stabilisers of the hips, and have a large influence on the knee. The glutes produce external rotation at the hip which places the knee in a strong position. When the glutes “switch off”, the hips internally rotate and cause the knees to collapse inwards (valgus) which places the most stress on the ACL. 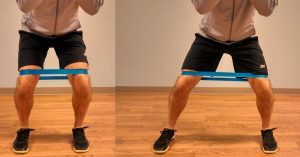 Band Walks – Begin with an elastic theraband wrapped around just above your knees ; Push your bum back so that you are in a quarter squat position; Begin to side step (either way) 10 metres before side stepping back to the start. When side stepping, make sure to keep your feet facing forwards, knees pushed out for each side step, and maintain the original quarter squat stance throughout the entire exercise. Remember, this is a controlled exercises to activate glutes rather than strengthening, so be strict with your form. Banded Glute Bridge – Begin lying on your back with the elastic theraband wrapped around just above your knees with your feet flat on the floor. From this position, engage your core (don’t allow movement in your torso) and squeeze your glutes to drive your hips up and push your knees out against the resistance of the band. Make sure to not hyper extend your back and maintain a flat neutral spine. Use your glutes to control your hips back down to the ground & repeat the movement. Progression: perform this exercise using a single leg, and keep the unused leg straight through out the reps.
Quadricep strength dictates how strongly a person can lock their knee in extension. Having good quadricep strength helps to prevent jerking actions at the knee, caused by landing or pivoting movements, which can be associated with ACL injury. Leg Extensions Lock Outs – This is a simple yet very effective quadricep strengthening exercise which I highly recommend! This exercise can be done on a leg extension machine at a gym or with a resistance band tied to something secure (for the sake of the blog I’ll explain this using the machine). To begin, sit on the machine and tuck your legs under the machines padded arms that you push against. Preferably this exercise will be done with one leg at a time, to prevent building imbalances. From the starting position, all you’re going to do is, straighten your knee until it’s locked out and your leg is parallel with the floor. Hold the weight at the top for a second or two and then control the weight back down to the starting position. Reps & Sets – 3 sets, 8-12 reps on each leg. 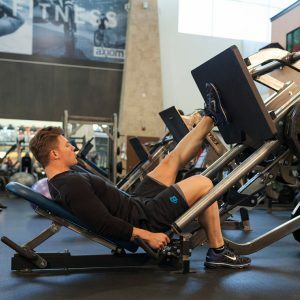 Leg Press (Single Leg) – Again, this exercise is most effective performed on a leg press machine within a gym, so I’d recommend finding a local gym that you could use. Alternatively, you can do single leg squats. To begin, sit on the leg press seat and place one foot on the leg press board (what you press against) and let the other leg relax. Select an appropriate weight, start light then build the weight up gradually. Push against the leg press, making sure to push through your heels and don’t allow your knees to collapse inwards (knees should follow the line of your 2nd toe). At the top of the press, make sure you don’t lock out your knee, then control the weight back down to the start position & repeat. Knee stability exercises help to improve the muscles ability to reinforce the ligaments stabilising the knee. This is important for when landing or twisting or when moving on an uneven or slippy surface to keep the knee stable. Knee stability exercises are generally performed single leg and/or on a stability board to replicate periods when the ACL could become compromised. If we can stabilise in these positions, then we will be making big strides towards preventing ACL injuries in the future. These next exercises will preferably be performed on a stability pad, however, a stability pad is not a necessity. Lunge Twist Stability Pad – Begin this exercise, standing with a light weight in your hands and a stability pad in front of you. Lunge forward with one leg, placing your forward foot on the stability pad. Once in the lunge, twist your torso with your arms straight, over the forward knee. Bring your arms back in front of you and step back to the start position & repeat. Ensure your knee follows the line of your 2nd toe. Reps & Sets – 3 sets, 8 reps on each leg. Single Leg Stability Pad (Throw, Catch, Sports Specific) – This exercise may require a partner to assist depending on your sport. Begin standing with one leg on the stability pad, the other leg will be kept up and not touching the floor. Depending on your sport, have a partner pass you a ball (e.g. if you play football, use your non standing foot to pass the ball back) and you will return the ball by passing with your non standing foot, or catching and throwing back to your partner. Reps & Sets – 2 sets, 30-60 secs on each leg. Having good cutting and landing technique is essential in game sports to prevent ACL injury. Majority of ACL tears occur during a CoD or landing from a jump, so it would be appropriate to strengthen these areas and make you aware of what good technique consists of. The next 2 exercises aren’t necessarily exercises, they are a breakdown of what good technique consists of and Q’s you should be aware of when performing these manoeuvres. Being able to change direction and land correctly will massively help towards preventing ACL injury. CoD & Cutting Drill – This is a scientifically proven drill to reinforce good cutting technique. Jog straight ahead; plant on the right leg and cut to change direction to the left and accelerate again; sprint several metres before decelerating to plant on the left foot and cut to the right. It’s important to focus on not allowing your knee to collapse in on itself when planting your outside foot. It also helps to stay in a low power position because this will place your knees in a stronger position to make a safe cut. Repeat this drill, making 10 cuts on each leg. Hop & Plant Drill -This is also a scientifically proven drill to reinforce good landing technique, especially when landing on one leg. The drill focuses on being able to land hops in any direction which replicates game situations where you could suffer ACL injury. This is a very simple drill, begin standing on one leg; bound as far as you can, in a direction of your choice, and land on the other leg. When landing, make sure to land on the balls of your feet, bend at the knee and hip to cushion the landing, and ensure that your knee doesn’t fall in on itself. It’s important that when you do land, that you stick the initial landing and don’t need to hop again to control the landing and make sure that you’re in complete control of the movement. Repeat this drill, making 10 hops on each leg in all different directions. So those are my best exercises to prevent ACL injury, the idea of this post was to make you all more aware of how to prevent ACL injuries from occurring in the future, so hopefully I’ve succeeded. Anyways, I hope you enjoyed reading and found this post helpful. If you’d like any further information, please get in touch.